Photography on the Run - Page 192 of 193 - Images taken on trail runs, and other adventures, in the Open Space and Wilderness areas of California, and beyond. All content, including photography, is Copyright © 2006-2019 Gary Valle. All Rights Reserved. 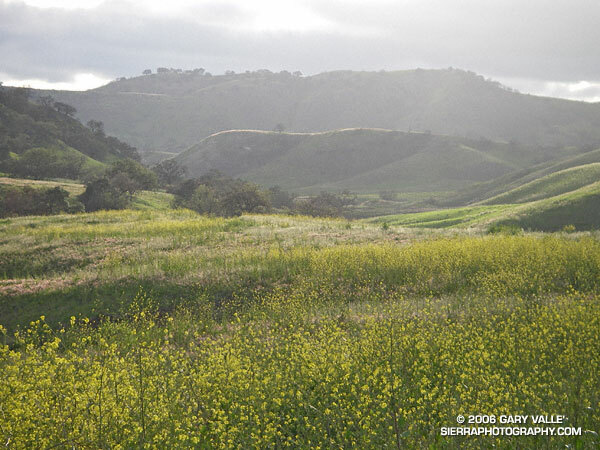 Since its acquisition by the Santa Monica Mountains Conservancy in late 2003, Ahmanson Ranch is referred to as the Upper Las Virgenes Canyon Open Space Preserve. Just six months ago, this area was burned in the Topanga Fire. 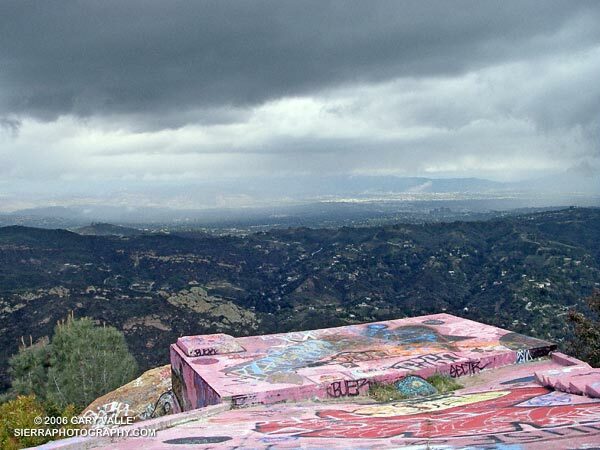 Clouds and showers over the San Fernando Valley from the abandoned Topanga fire lookout site. 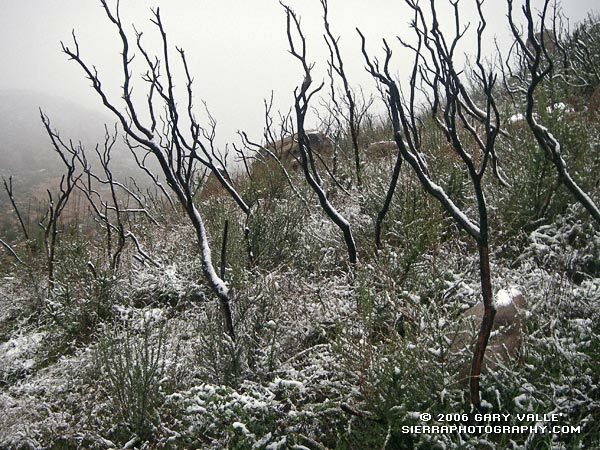 Snow highlights skeletal fingers of chaparral burned in the 2003 Simi Fire. From the Chumash Trail in the eastern Simi Valley. More info and a couple of additional photos can be found in my Coyote Oak Journal entry Chaparral Snow. 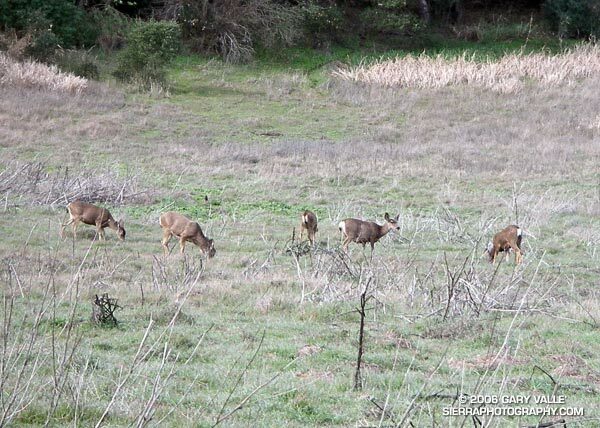 Snapshot of deer at Malibu Creek State Park. This group was in about the same location on consecutive weekends. Malibu Creek State Park is about 30 minutes from downtown Los Angeles. 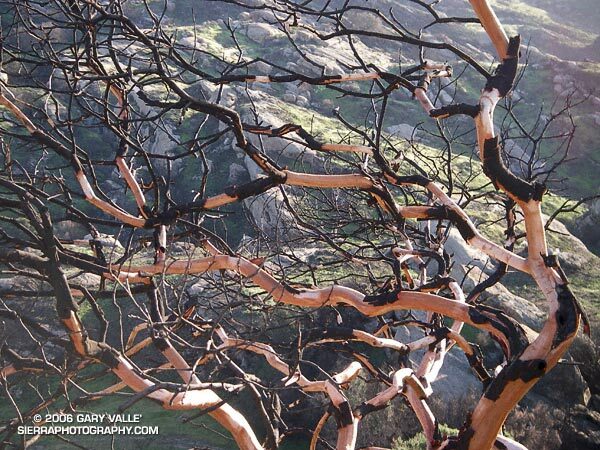 Fire-sculpted limbs of a Laurel Sumac in Black Canyon, near Simi Valley. Rock formations along the Backbone Trail in Malibu Creek State Park. 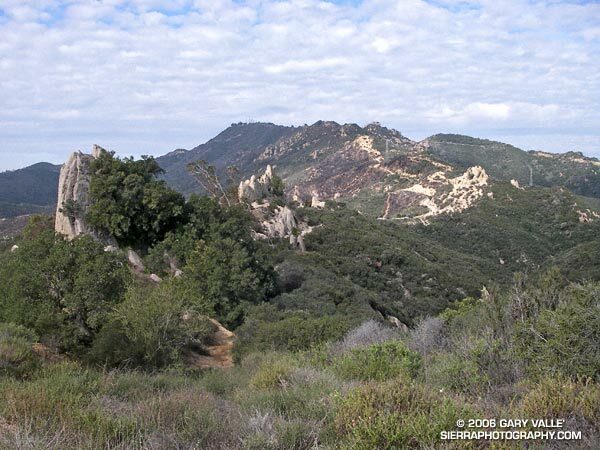 This segment of trail is part of the Malibu Creek Trail Challenge and Bulldog 25K and 50K. The final quarter-mile of the infamous Bulldog climb can be seen along the right skyline. I’d just struggled up that a few minutes before. An elevation gain of 1700 ft. in 3.5 miles sounds not-so-hard sitting in front of a computer, but the climb has few breaks and is longer and steeper than those figures convey. The Bulldog climb is part of the ~14.5 mile Bulldog Loop — an excellent course that is popular among runners and mountain bikers. My Polar HRM says the elevation gain/loss on the loop is about 2700 ft., and a quick calculation using the elevation profile in Sporttracks gives a gain/loss of 2500-2600 ft. In 2004 Sal Bautista ran the slightly shorter version of the loop done in the Malibu Creek Trail Challenge in under 1.5 hours! Here’s a Google Earth image of a GPS trace of the Bulldog loop.